Originally from Nottingham, April studied dentistry at Birmingham University, where she also went on to complete a Postgraduate Vocational Training course. 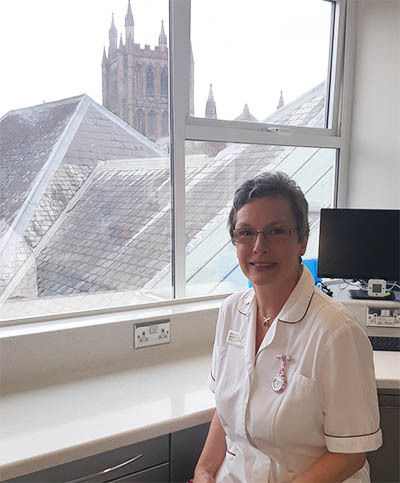 Following this she gained further experience working for several years in General Practice in Bath and West Sussex before moving to Hereford with her family. April joined Broad Street Dental Surgery in 2006 providing high quality dentistry in a relaxed and friendly environment. April is a regular attender at the Gloucester Independent Dentists’ group. This enables her to keep up to date with current thinking in dentistry, with lecture days from world renowned speakers, and hands-on experience days that enhance her practice of dentistry. In her spare time she enjoys playing the piano and trombone (to an almost tolerable standard), and has been known to appear with the Monmouth Town Band on occasion. She also keeps vaguely fit by walking her crazy labrador and frequently recounts comical tales of his misdemeanors!